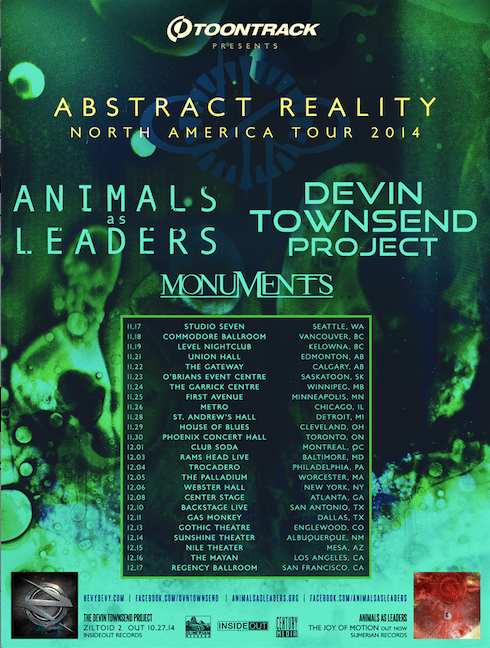 Progressive and tech metal fans are in for treat this November and December, as Animals as Leaders have just announced the North American tour together with Devin Townsend Project and Monuments billed as Abstract Reality. Animals as Leaders released their third studio album The Joy of Motion in March, and ever since then they receive great reviews from all around the world. Devin Townsend Project is scheduled to release Ziltoid 2 on October 27 via InsideOut Music. Monuments released their second full-length on June 23 titled The Amanuensis. Check the full list of dates below, along with the official tour poster. Animals as Leaders will be hitting the road in Europe this fall together with TesseracT. Read an interview with Animals as Leaders‘ guitarist Javier Reyes here.